Cook for 3 minutes untill their lips opens up. Pour away the juice and set aside to cool. 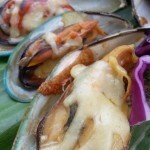 Once cooled, remove top half of the mussels' shell and remove the mussel's "strings/roots". Place them back to the BBQ or Oven to cook. 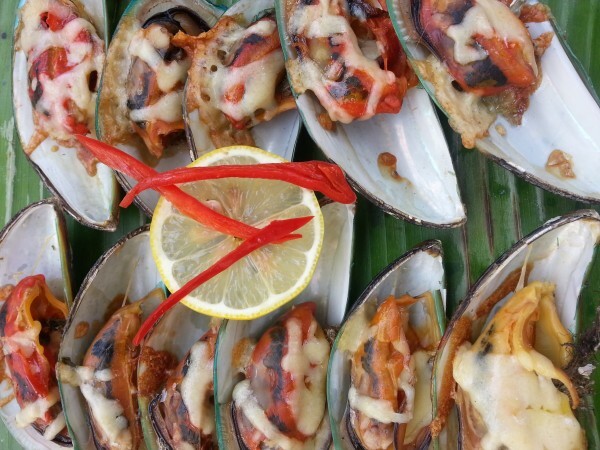 BBQ or bake until the mussels meat is dry. Remove water whenever it accumulates. After 18 minutes, add a piece of cheese and let it cook another 2 minutes.